What a change takes place in your mind and imagination when it dawns on you that you are not the star of your own play, when it dawns on you that you are actually working for God and not vice versa. You are an employee in his company! That means that he sets up your job description, assigns you a salary, and determines your benefit package. What a relief it is when it dawns on you that your earthly life is not the be-all and end-all. This is training time. God is using us as he needs us, and we often can’t see our influence or roles clearly. Sometimes we serve his agenda by being strong, sometimes by being broken. Sometimes we serve his agenda by being famous as achievers and sometimes by “failing.” What matters is to accept his guidance eagerly and accept his place and opportunities in life cheerfully. Here is the bright hope that draws us on: “Instead of their shame my people will receive a double portion, and instead of disgrace they will rejoice in their inheritance; and so they will inherit a double portion in their land, and everlasting joy will be theirs” (Isaiah 61:7). God always gets the last word. Even when you feel like a failure now, his last word is Winner! Challenge Grant makes your gift worth TWICE as much! Generous donors have stepped forward with a $350,000 grant—and they’re challenging friends like you to meet it in full! That means your gift will be worth TWICE as much to help share the timeless truths of God’s Word through television and digital outreach. 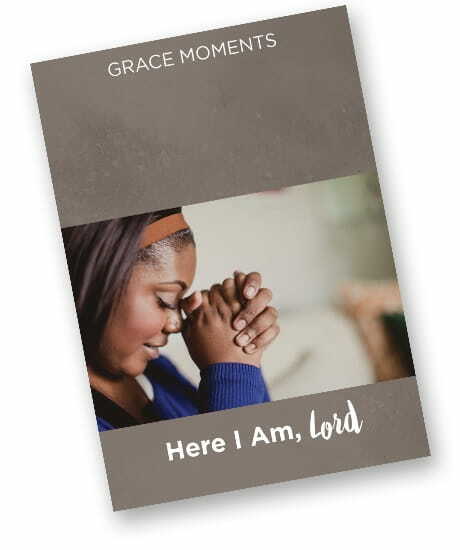 When you give, we’ll say thanks by sending you our 30-day devotional book Here I Am, Lord to help you build a closer connection with God.